I thought that they were great workers, friendly and being very thorough throughout. When I inspected the work I couldn’t find any errors at all and was very impressed with the fact that Mike didn’t even have to use tape to get such straight lines along edges. Some friends who came by were also impressed by the quality. Rick, too, was very friendly and was great at communicating and coordinating everything. The cabinet doors he painted at the shop looked great. I would recommend them to anyone else seeking quality work and will certainly ask you guys to do any jobs for us in the future. Jon and I could not be happier with our room! We can’t believe how great it looks, I had no idea that painting would have such a huge impact! We really appreciate your service and everything is perfect! Thank you so much! A job move and a retirement put us in the position of having to prepare our house for sale with only a few weeks lead-time. I contacted Joel’s Painting because of the good reviews on Angie’s list. Joel came out promptly and gave a good bid on the painting. Much to my surprise, he was also willing to take care of masonry, roofing, and carpentry concerns. He also connected me with a colleague who came out within a day to bid on replacement of 2500 sq ft of basement flooring. My first thought was that this was too good to be true. At the same time, Joel’s help would save me the time of contacting four other contractors. While skeptical, I decided to give all the work to Joel. He impressed me as honest and really motivated to build his business through referrals from satisfied customers. Shortly after contracting with Joel I had to be out-of-state for 10 critical days while the work was being done. I gave Joel and his crew full access to my home while I was gone and was extremely pleased to find the work nearly done when I returned and everything in excellent shape. Once back, I got to know many of the members of Joel’s crew and they are good people with a strong work ethic. A few overlooked odds and ends arose (doors I forgot to mention in our original contract) and Joel was extremely fair in adding them on to the contract. What can I say? A contractor you can trust is extremely rare and one who performs the quality of work that Joel does is surprising, gratifying, and helps restore my faith in the goodness of my fellows. Joel’s price wasn’t the cheapest, but sometimes it is really true that you get what you pay for. I have to say that I have been very impressed with Joel and his men. The crew never played music and always talked quietly. They happily fixed anything I found. Joel showed up yesterday and found some things that I had missed. He made his guys fix any flaws and re-do some of their cut-in lines because he felt they could be better. Joel even pulled me aside and asked me if his men had been courteous, quiet, and discreet about any smoking. I told him that they certainly had been. I really respected and appreciated that Joel did that. So, overall I’d say I’m very pleased. Joel’s Painting, in Lancaster PA, did another amazing job painting our kitchen, breakfast area, and family room. Joel’s Painting is the best interior home painter that we have ever used. This is the 2nd time we have worked with him – they are neat, they do top quality work, they do it fast and his pricing is excellent. If you want to make your home look great – hire Joel’s Painting! 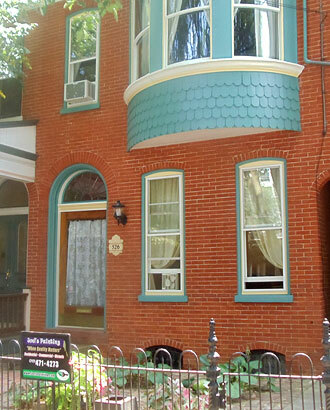 I want to give a glowing recommendation to Joel’s Painting, who just completed painting the front of my three-story house on Chestnut St, near the chestnut hill cafe. Excellent and meticulous workmanship on what was an elaborate job [3 colors, 160 year old house], from scraping, priming to 2 coats of paint. Respectful, polite staff who went extra distance and with good nature in this grueling heat. They arrive in uniform, clean trucks, and didn’t damage a single planting in front, which is not easy if you know my front yard and its narrowness. Each day they cleaned; you’d never know they’d been there working all day. I’d gotten several estimates, ranging from the well-know contractors to folks working solo. Joel’s firm’s bid came in right, and considerably less than a few of the famed local painters. Joel’s stuck to bid exactly, all invoiced professionally. So on the principle that one good turn surely deserves another, let me recommend Joel’s Painting and all their staff without reservation. I wanted to take the opportunity to write and thank you for your contributions to the successful completion of the exterior wood work restoration project at theCheney’s c1926 Colonial Revival Residence in Ardmore, PA. Our client is very pleased with the restored finishes of their front entrance porch and we wanted to pass this along. The job was finished two weeks earlier than promised! Joel was very helpful in making decisions on the paint and knew what he was talking about, but also kept our ideas in mind. Excellence is hard to beat. The profesional world could use more Joel’s.